Bijal Doshi is Sole Proprietors at Bijoux Bijal Participated in intensive yoga familiarization teaching course in appreciation and assimilation of the Philosophy, Psychology and Practice of the Science of Yoga. 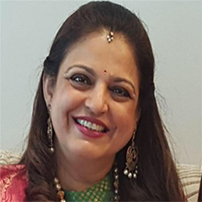 She is Currently conducting therapeutic and general yoga classes under the name ‘Bijal’s Yoga Divine ’ with unusual blends of Asanas, Pranayam, Mudras, Bandhas, Yoga Nidra, Sun-Salutations and Tibetan Rites and Meditation. She received Scholarship in the Silver Jublee year of Priyadarshani Academy in the field of Yoga Educational Scholarship and Literary Award Program. She received Certificate From Yoga Sadhana Seva Trust for Course & Research Paper in Yogic Philosophy & Yoga Therapy. She was Awarded the first prize in the Innerwheel South Asia Rally 2008. She is also contributing as The President in Indus International and also chaired various Committees Since 1991.